Are You Ready for Emergency Medical Services in Your Oral and Maxillofacial Surgery Office? 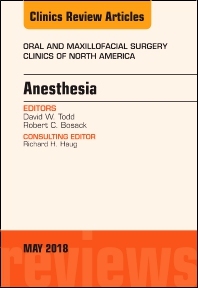 This issue of Oral and Maxillofacial Surgery Clinics of North America focuses on Anesthesia, and is edited by Drs. David W. Todd and Robert C. Bosack. Articles will include: When a bad day happens to the oral surgeon: the EMS interface; Preoperative evaluation and patient selection for office-based oral surgery anesthesia; Assistant training for anesthetic emergencies; Anesthetic agents for the oral surgeon; The failed sedation: solutions for the oral surgeon; Anesthesia for the pediatric oral surgery patient; Closed airway office based anesthesia for the oral surgeon; Oral surgery patient safety concepts in anesthesia; AAOMS Simulation Program: Increasing Anesthesia Team Competency; Airway management for the oral surgeon patient; Anesthetic pump techniques vs the Intermittent bolus: What the oral surgeon needs to know; and more!